Rimini is a land of genuine flavours and that loves the art of eating well. To check, just sit in any restaurant on the coast, or in any typical restaurant from the inside. Wherever you can, have lunch with the assurance of an excellent relationship between quality and price. On the table there will always be a ‘piada’, the symbol of the local Romagna cuisine. 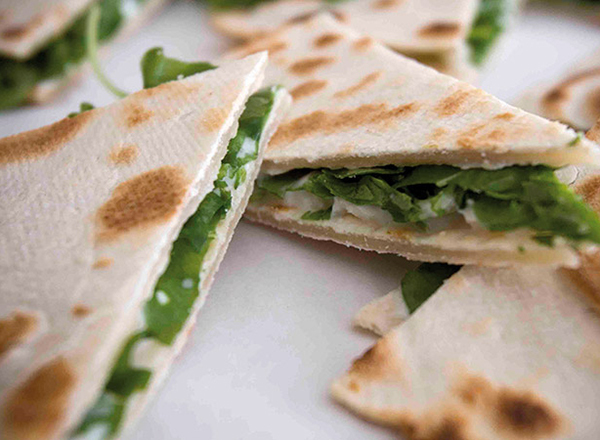 It is a thin, unleavened bread to be eaten hot together with ham and cured meats, or with soft cheese spreaded on top. A speciality appreciated by all are the first courses: made with homemade pasta (tagliatelle, strozzapreti, ravioli, gnocchi and cappelletti) and served with tasty meat or fish sauces. Roasts and mixed grills are proposed with great wisdom. But on the coast, the head of the table is fish, cooked according to tradition and often with some sort of sparkling originality. To accompany the meals there are wines that are typical of the Rimini hills (Sangiovese, Trebbiano and Pagadebit) that have reached high levels of quality. In inland towns there are a number of wine cellars where it is possible to taste and buy wines. In the hills it is possible to come across farms with the option of stocking up on high-quality cheeses. The production of oil, a longstanding tradition, has achieved enviable results in recent years (also obtaining the PDO), and there are numerous producers of exceptional extravirgin oil.